Growing Up and Glowing Up: Meet GamerSpeak! It’s a bittersweet moment when you have to acknowledge that it’s time for a change. It’s scary and daunting, thrilling and new. You go over a million things that could potentially go wrong, but in the end, it comes down to what is essentially right. As we turned the corner into 2018, we decided it was time to re-analyze who we are as a company now, versus who we might have been just a few short years ago. Universally, we agreed that we had changed – grown – but we’d also become stronger and more diverse in our abilities and offerings. App Scrolls, at its fledgling roots, focused on the mobile market, but we now offer a suite of services tailored to the gaming world as a whole. We cater to companies who offer FPSes just as easily as an RPG. We’re fluent in the language of our people – the gamer in any form – and accurately identify their needs and thoughts to our clients in ways that translate to metrics. In short, we’ve evolved to a more encompassing form; App Scrolls no longer accurately reflects that. 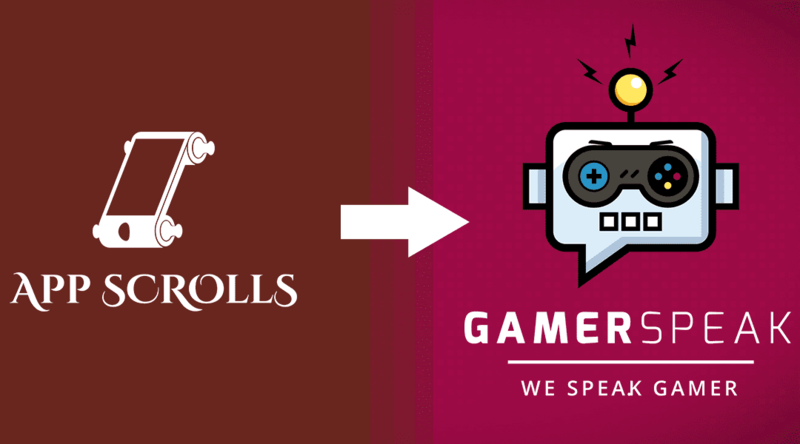 Today, we’re excited to announce that App Scrolls is now known as GamerSpeak, a game-focused marketing firm with its roots firmly grounded in publisher relations through insight-driven communities. We will continue to bridge the gap between gaming companies and players through targeted and quality information, but now also offer a more diverse palette of solutions. Our gamefluencers continue to identify positives and negatives in every gaming community they enter, but also provide valuable insights during pre-release, giving our publishers unparalleled information. Whale relations by actual whales? It really does exist. To our current clients, thank you for growing with us into the company we are today. You have helped us find our strengths and curtail our weaknesses. We cannot wait to build further with you in the future. To potential new clients, we have never been more ready to offer you complete and dynamic services tailored to the gaming vertical. Contact us today, and let’s get started! Welcome to the future of GamerSpeak!